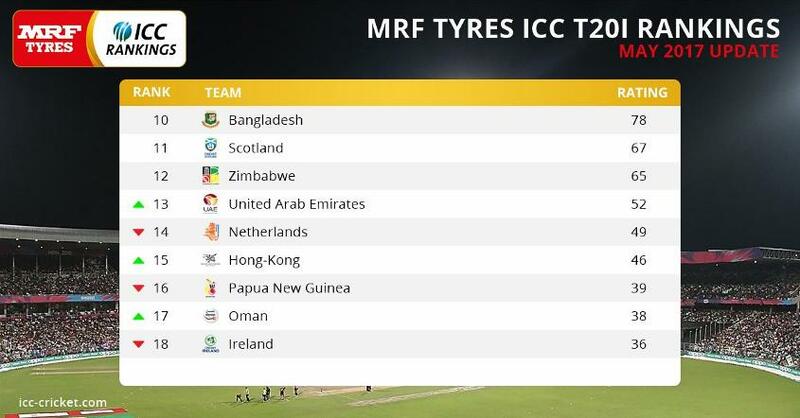 England has vaulted into second place on the MRF Tyres ICC T20I Team Rankings following the annual update*, which was carried out on 1 May to ensure the table continues to reflect the recent form of sides. England has benefitted significantly as it has risen three places after gaining seven points to now sit on 121 points. Eoin Morgan’s side is four points behind table-topper New Zealand, which is on 125 points after dropping two points. 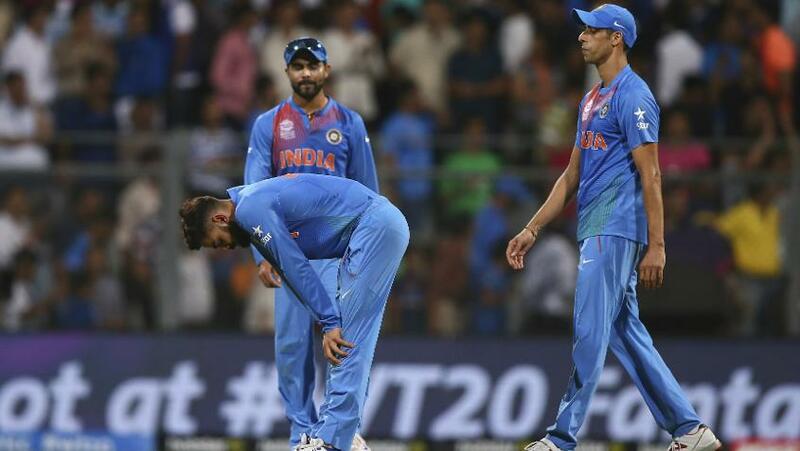 India, the ICC World Twenty20 2007 champion, has also lost ground following the annual update after dropping six points to slip to fourth position. It is now on 118 points, three points behind ICC World Twenty20 2009 winner Pakistan, which has joined England on 121 points after gaining five points but is ranked behind the ICC World Twenty20 2010 winner by a fraction of a point. India has lost ground following the annual update after dropping six points to slip to fourth position. South Africa has slipped two places to fifth ranking after conceding six points, but is one point ahead of Australia. Australia has swapped places with reigning ICC World Twenty20 champions, the West Indies, which is 14 points ahead of 2014 winner and eighth-ranked Sri Lanka (95 points, down by four). Bangladesh is ranked 10th on 78 points after gaining four points, while Zimbabwe has retained its 12th rank after gaining three points. Among the Non-Test playing sides, Afghanistan and the Netherlands have moved in opposite directions. Afghanistan is the side to benefit most after England as it has gained six points and climbed to 90 points. But while Afghanistan has strenghthened its ninth position, the Netherlands has dropped nine points to slip one place to 14th rank. Australia and the next nine highest-ranked sides will qualify automatically for the ICC World Twenty20 2020. Scotland is in 11th rank on 67 points (up by four), followed by the UAE in 13th (52, up by four), Netherlands in 14th (49, down by nine), Hong Kong in 15th (46, up by three), PNG in 16th (39, down by four), Oman in 17th (38, down by one) and Ireland in 18th (36, down by four). Australia and the next nine highest-ranked sides on the MRF Tyres ICC T20I Team Rankings will qualify automatically for the ICC World Twenty20 2020 which will be staged in Australia. The bottom eight sides on the team rankings will get a second chance to qualify for the seventh edition of the tournament when they will join the regional qualifiers in the ICC World Twenty20 Qualifier 2019. Six sides will qualify from the qualifier to complete the 16-team line-up. Six sides will qualify from the ICC World Twenty20 Qualifier 2019 to complete the 16-team line-up. * All results from 1 May 2013 to 30 April 30 2014 have been dropped from calculations, while matches played from 1 May 2014 to 30 April 2016 are weighted at 50 per cent and matches played from 1 May 2016 are weighted at 100 per cent.